When Opportunity Knocks! 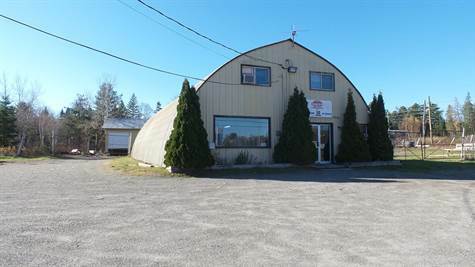 Located in a highly visible intersection & 2.29 km (+/-) from schools & hospital, this prominent area for commercial & possible industrial use features 1.12 acres(+/-) to expand on. The main building (54x40) boasts a large sales floor area with a display window, renovated 2pc bath & office. The receiving area in the back is spacious with loading doors & opens into a storage area, second office, furnace room & employee bathroom. Upstairs is wide open & perfect for additional storage. The 26x52 4-bay warehouse is located behind the main building & boasts a partially fenced in area. A 200 amp entrance with 3 phase power, drilled well, new septic in 2000 & an over-abundance of parking space are just a few of the reasons why this new listing with so many possibilities is just waiting for you & your NEXT big adventure! Please note: Price does not include HST.